"Children of the Holocaust" is the association of Holocaust survivors who at the outbreak of the Second World War were 13 years of age or younger, or were born during the war; who because of their Jewish origins were targeted for extermination by the Nazi occupiers, were incarcerated in ghettoes, concentration camps or death camps, or had to conceal their identity (Statutes of the Association, Chapter II, 12). The first World Congress of Hidden Children was held in New York on May 26-27 1991. 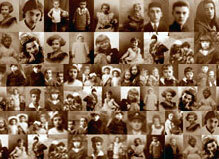 Soon thereafter we convoked a founding meeting of "Children of the Holocaust" in Poland. It opened on June 27, 1991, and was attended by 45 persons. Board meetings take place on the second Thursday of every month at 3.30 PM. Members of the Board receive visitors to the Association's office every Tuesday and Thursday from 2 to 4 PM. The General Meeting of the Association takes place once a year. The last one was held in Miedzeszyn, August 30th - September 2nd, 2012. It is our moral obligation to those who perished, and our duty to the young generation and their future, to carry out educational programs telling the truth about the Holocaust. the ones who help us to help others. Our members are dealing with the past as best they can; however, some just cannot cope. For these members we have created a special therapeutic program. This chapter will be edit by all of us. If you like to share with us some more or less important information, please do it. It is enough to send an email with attached news to our Association chsurv@jewish.org.pl.